Infidel was written by Michael Berlyn and Patricia Fogelman, and published in 1983 as one of Infocom's rare forays into well-traveled adventure game territory. Egyptian-themed treasure hunts were popular as far back as Scott Adams' Pyramid of Doom and Radio Shack's Pyramid 2000 (an Egyptian theme thrown on top of a portion of the Crowther/Woods Colossal Cave Adventure). The theme may have been a bit overworked, but Infocom's advanced parser (still in use by interactive fiction authors today) and evocative writing by Berlyn and Fogelman managed to deliver a dig site tale worthy of its legendary publisher's reputation. I first encountered this game in truncated form, as part of an Infocom sampler disk back in the mid-1980s; I played it properly for the first time through Activision's 1991 compilation, The Lost Treasures of Infocom. 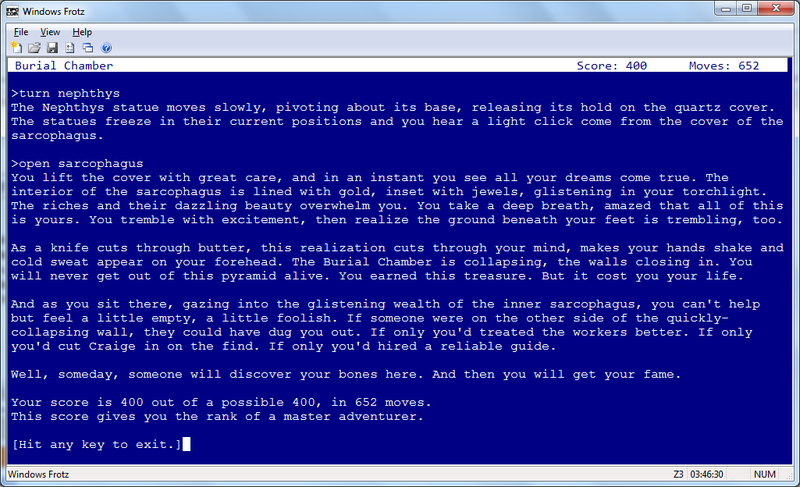 For this playthrough, I'm running a vintage Infocom Z-file under the contemporary WinFrotz interpreter for Windows PCs. The story begins with our hero (more of an anti-hero, actually), obsessed with finding a legendary lost treasure despite inexact knowledge of its location, abandoned by his crew on account of dwindling food, deferred pay, and forced work on a religious holiday. The titular Infidel wakes up to the sound of a droning plane engine, delivering a critical navigational instrument slightly too late to be of use. Our first order of business is to get out of our cot, leave our tent, and flag down the plane with a quick WAVE TO PLANE. It drops a parachute with a crate, which conveniently lands near us. We can READ CRATE to learn that it contains "1 (one) black box (tm)", and simply OPEN CRATE to obtain the navigation box. This sequence is indicative of the game's overall style -- we don't have to go hunting for a crowbar buried in a locked trunk or lost in the sands or stolen by a monkey; the crate is designed to be opened, as it should be. Now that we have the box, we can easily determine our current latitude and longitude. We have to consult the official documentation to find the right location for digging -- a simple form of copy-protection -- where a map indicates a hieroglyphic cube was discovered at about 24 degrees, 11 minutes, 3 seconds latitude and 32 degrees, 12 minutes, 43 seconds longitude. Before we go out digging, however, we should explore our encampment and gather necessary supplies. A shiny piece of foil by the fire pit turns out to be an empty pack of Camel (get it?) cigarettes, and a matchbook. We can EXAMINE HOLE to be entertained by the many unproductive holes littering the camp. The supply tent still contains a pick axe and a shovel, so we have some basic implements available. A note in the workers' tent reads, in part, "Fi aman Allah! Hereafter you shall pursue your fool dream of the hidden pyramid and its riches alone." It informs us that several critical items are in the padlocked trunk in our tent, but that our former employees have not left the key behind. There is also a knapsack here, with some rope and a canteen -- empty, of course. The knapsack has an interesting implementation -- we can sling it onto our shoulders, in which case we are unable to examine its contents, and when we take it off its flap automatically opens for easy use. We can fill the canteen, and drink directly, from the Nile to the west. The camp is otherwise bounded by impenetrable thickets and the vast expanse of desert to the east. We can use the pick axe to break the padlock -- again, a simple and reality-based puzzle -- and eat the dried beef in the trunk to quell our growing hunger. The trunk also contains a map and an inspection sticker, alluding to the Zork universe: This reality was manufactured by tiny elves from the Bozbar Pyramid Construction Company, a jointly-owned subsidiary of the FrobozzCo Magic Village Industries. There's a map in the trunk, which contains in its folds the hieroglyphic stone cube alluded to on the map. The cube is marked with symbols (alphanumeric to suit the text-based, portable Infocom parser) which we can interpret using another documentation artifact. At this point, though, the message doesn't make much sense -- it seems to be out of context, reading "The queen and all queen treasures." So now we are fed, watered, and ready to venture into the desert. We can use the box to navigate to the only notable location we're aware of, and then start digging. Even the venerable Infocom parser gets tripped up a bit by some grammatical/object complexity here -- if we just DIG, we are prompted What do you want to dig in?, and a response of DIG SAND assumes (with the shovel). But if we then try to just DIG SAND again, we are prompted What do you want to dig the sand with? We should DIG SAND WITH SHOVEL for optimum efficiency. After five rounds of digging, we find the top of the pyramid (if we are in the right location). It has a square opening in its top, and the hieroglyphic cube acts as a key. We find more hieroglyphics here, which seem to place the cube's message into context to read something like, This entrance lies queen and This entrance toward all queen treasures. We can't INSERT CUBE INTO TOP OF PYRAMID (I don't know the word "top") or INSERT CUBE INTO PYRAMID (You can't do that) but we can INSERT CUBE INTO OPENING to gain entrance to the pyramid. Our "hero" sneers with joy at his discovery, "without any help from those idiots" -- it's interesting to play an unlikable chap once in a while, and we really don't care for this guy. Continuing down the narrow hallway, we find ourselves in the Barge Chamber, where the royal barge may be boarded. There are two cabins onboard, and a thick hardwood pole with a symbol on it that, again, we haven't encountered yet. A hieroglyphic scroll in the fore cabin appears to reference some numbers -- 1, 3, 5 -- but most of the other symbols aren't yet recognizable. The aft cabin has a ladder leading down into the ship's hold, but we can't CLIMB LADDER - Bizarre! - but can only go D. The mast ends down here, with its end wedged into a slot; we can't easily lift it, so freeing it from its moorings will probably be a valuable thing to accomplish. Closer examination reveals a shim, so we can simply GET SHIM and then LIFT BEAM. Except we have to drop everything to be able to lift it, so we simply DROP ALL and immolate ourselves as our torch causes the whole barge to go up in flames. Oops. There's a curiously functionless knothole on the wall -- we can INSERT TORCH IN KNOTHOLE, drop everything else and lift the beam enough to hear it thud onto the deck above. The whole point of this exercise seems to be to allow us to GET BEAM, so we should do that; the knapsack's ability to hold many small items starts to come in handy at this point. Back we go to the Chamber of Ra, where the winding eastern stairway takes us down into a Cube room with two new exits. This proves to be the entrance to a series of nine rooms; hieroglyphs in a room on the south side confirms the hieroglyphic numbering system and lays out the rooms in numeric order, and the center room depicts the Queen's burial process. There are nine numbered bricks which can be removed; taking the first, third and fifth brick (as hinted by the scroll on the barge) opens up a secret passageway into the ninth room. This ninth room leads to another downward staircase, passing images of happy priests and an odd girl dressed in black. The stairs lead to a blank plaster wall, with more hieroglyphs that are difficult to translate. Going back to the Chamber of Ra does not help us at this point, because the western staircase just leads back down into the Cube rooms. So we will have to start figuring out some of these puzzles. We can't seem to destroy the plaster wall with the pick axe, although this is primarily due to an obstinate parser -- BREAK PLASTER -- What do you want to break the plaster with? -- PICK AXE -- You can't pick that. The hieroglyphs here appear to read something like, "To the king and to... ???" That's assuming that since !@! means queen, !!! means king in a typographical extension of early human gender symbology. Back in the central cube room, there are some hieroglyphs we haven't yet examined. It looks like maybe we're supposed to put something on the altar in the Chamber of Ra. But what? A treasure? I consulted an online translation guide for a hint -- it turns out that !!! means plaster, not king, so there goes my best idea so far. Which means that the symbols on the plaster wall actually just mean Remove the plaster and go west (actually, some later usage indicates that !!! really means seal.) That's what I was trying to do anyway, so the translation is of no great help. Except -- aha! While we can't BREAK WALL WITH PICK AXE -- Trying to destroy the wall doesn't work -- or BREAK PLASTER WITH SHOVEL, we can REMOVE PLASTER and the game assumes (with your pick axe) for us. Beyond the plaster wall is a long, narrow passageway, leading to a timber-framed doorway blocked with plaster and low niches on the walls. We can, of course, REMOVE PLASTER again, but it's fatal this time, as sand flows out of the doorway and we plummet into a nest of rats. What we can do instead is PUT BEAM IN NICHE, so it spans the room; CLIMB BEAM; and then remove plaster, so that the sand and the floor fall away and we can now access an inner door. Opening the door requires no puzzle-solving, but we are greeted by a musky odor. We can enter the Antechamber, a.k.a. the Chamber of Eternal Royalty, with a painting of the marriage of Isis and Osiris. The northern end of the chamber depicts a ceremony involving restoration of the Queen's mouth and eyes; there are also some hieroglyphics here which I took to mean we should put the beam in the niche and remove the plaster, which we had already done, though this may aid our future decoding efforts. The message at the southern end of the chamber tells us to do something else with the beam -- fortunately we can retrieve it, as it appears we will need it here. We can wedge the beam into the doorway, so that it prevents our being crushed by large stones when we open the door. We can now access the Chamber of Rebirth, where a slab with four empty holes in it oddly seems like the most interesting thing, even though the room is quite nicely decorated. Unfortunately, if we exit the room and retrieve the beam, the stones finish their slide and the Chamber of Rebirth is forever blocked. So we shouldn't come here until we are done using the beam elsewhere. Restoring and returning to the north end of the Antechamber, and realizing the symbols on the wall were not in fact as redundant as I had thought, I saved my game and then tested the door to see if I was on the right track. If we break the seal on the door, sand flows in from above and we are dead. But I couldn't successfully PUT BEAM OVER DOOR or STAND BEAM IN ROOM or PUT BEAM IN DOORWAY; we have to PUT BEAM UNDER LINTEL and then remove the seal, as the hieroglyphs indicate. Now we can reach the Burial Chamber, where the Queen's coffin lies surrounded by four statues of Isis, Nephthys, Neith and Selkis, locking its cover down. The cover has two small recesses, both empty. The Treasury to the east has an odd table with three discs and a scarab weighing one of them down. Simply taking the scarab is fatal. Pushing the empty discs reveals that the three are self-balancing; the scarab must be very light, as putting a matchbook on either the left or right disc pushes it two inches below the surface of the table. We probably need to balance this out somehow, but matches don't seem to do the trick even though they should weigh about the same. I have found some puzzles but have no way to solve them -- and as I have moved the beam, I can't go back the way I came. It seems like I must be missing something, and that northern staircase seems like it's there for a reason, so I restored and went back to the Chamber of Ra. We have a rope in our knapsack -- we can tie it to the altar, and then... die when we try to go down the staircase with the rope in hand. We have to THROW ROPE NORTH after tying it to the altar, and now we can CLIMB ROPE to reach the Circular Room. This is a hub of sorts, with passages in the corners, a short statue, and a golden cluster. The doors here are balanced halfway open -- when we approach one, it closes off, while the one in the opposite corner opens up. If we try to push the statue into place to fool the mechanism, though, it topples and its head breaks off. The same happens if we try to GET STATUE. But this is okay, as we can move the statue and its head together to put enough weight in one hallway to counterbalance the opposite door. Now we can collect an emerald from the beautifully decorated Chamber of Isis, a ruby from Selkis, a diamond from Nephthys, and opal from Neith. We should also note here some (@) symbols that might correspond to one of the Antechamber puzzles; it appears that Nepthys with the diamond to the northwest corresponds to slot 4, Selkis/ruby/NE slot 2, Isis/emerald/SW slot 3, and Neith/opal/SE to slot 1. The torch does burn out from time to time, but can be replenished and relit as long as we have the jar of oil and the matchbook available; this can be done safely in the dark as long as we remember the details. The four gems from the Circular Room go in the holes in the slab in the Chamber of Rebirth, but it turns out that the location of the rooms, not the number symbols, determines where they go; if we place a gem correctly, there's a confirming click, so it's not that hard to figure this puzzle out by trial and error. Once they are in place we can OPEN SLAB to find a spatula and an ancient book. It's not that a modern kitchen spatula -- examination reveals that it's intended for use in turning the pages of books, and if we try to open the book without using it, it crumbles into dust. If we carefully OPEN BOOK WITH SPATULA, we can read some hieroglyphs. Many objects, like the beam and the book, seem to be labeled with their own hieroglyphs, which eases translation a bit. The book (if I'm translating right) tells us that we should put the book in the larger recess of the queen's sarcophagus, and the scarab in the smaller one. Which means we still need to obtain the scarab somehow, and I'm no closer to solving that puzzle than I was earlier. So what else can I do? I had missed an area of the map north of the Barge -- I was wondering why there are "rooms" all around it -- and here I found a steep passageway leading to a Temple Chamber. Here we see faint, faded paintings of the Queen and her attendants. In the Inner Chamber we find the remains of a previous adventurer -- a jeweled ring on his hand eventually proves fatal if we put it on, so we should just leave that alone. In a couple of smaller side chambers, we find a silver and a gold chalice. These seem nicely matched, so perhaps we can use these to obtain the scarab. Back in the Queen's chamber, we find that the silver and gold chalice do not balance each other any better than the matches did. Dang. Examining them reveals that the gold chalice is heavier than you thought it might be, while the silver chalice is not very heavy and has a line around the inside. So maybe we can balance it somehow. Putting a match into the silver chalice doesn't do anything. Maybe the line is a fill line? Pouring water from the canteen into the chalice fills it up to the line, perfectly. And now we can safely take the scarab! Putting the scarab in the small recess of the Queen's sarcophagus, and the book in the large recess, produces a click beneath the four statues. But we still can't open the sarcophagus. We have to TURN each of the statues to get it to release its grip. But after all four are turned, they turn right back into place again. Does the same order that applied for the stone slab also apply here? No -- if we do that, the last statue (Neith) stubbornly turns back into place. But it works if we follow the numeric sequence here, turning Neith, Selkis, Isis and Nephthys, in that order. Now all we have to do is OPEN SARCOPHAGUS, and victory -- of a decidedly and deservedly mixed variety -- is ours! Nobody did commercial text adventures quite as well as Infocom -- Infidel's attention to detail and focused puzzles, as well as its unconventional take on the player character as antihero, makes it well worth playing today. 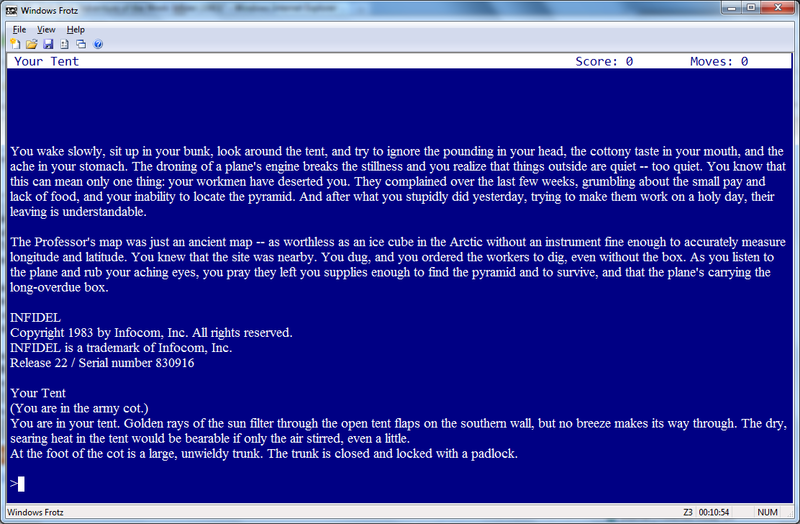 I thoroughly enjoyed this adventure in interactive fiction, and have reminded myself to tackle more of the company's classics in 2012. I agree. I remember this game very fondly and it falls into the whole Indiana Jones/classic adventure scenario very well. I loved adventures set in deserts and jungles and I also loved the packaging of this one.. This and the Zork Trilogy were my favourite Infocoms.